Just over a month ago I wrote a piece regarding the speculation surrounding the forthcoming, next-generation iPad. At the time it seemed that the new iPad would have a Retina display, faster processor, the possibility of 4G LTE networking, and a case redesign. A month later, some expectations have changed, and some things remain the same. Here is the new rundown of what is expected to be in the next-generation iPad. As with my last piece regarding this matter, I have no inside information, and what is written here is purely speculation based on the latest information received from the rumor mill. Just as with my last report, most of the speculation surrounding the next-generation iPad stems from its display. Many believe, as do I, that the new iPad will have a Retina display with double the resolution of the current-generation iPad. Since that first report, something as close to proof as we can get has surfaced: component photos, and a nod in the affirmative from MacRumors*. As with the iPhone 4 and 4S, a Retina display allows for print-quality text. This is achieved with a 2048×1536 resolution working out to a 264 ppi, which is above what the human eye can perceive as separate dots at a certain distance from the viewer. To drive this richer display, it is expected that Apple will shoehorn even more power into the iPad. Original speculation dubbed the new processor the “A6”. Just recently, however, component photos have surfaced showing a chip labeled as “A5X”. No technical details were discovered, but the broad consensus is that this new ARM chip will have quad-cores, and if other reports are to be believed, 20x graphics capabilities over the current A5 chip. Yet another report claims Apple is working on two different chips simultaneously, so who knows what we’ll see in regards to processors. Regardless if these specs come to market, I would wager on a faster chip being incorporated in the new iPad, simply because more power will be needed for the new display to function at speeds Apple would find acceptable. Throwing in my own speculation, I believe Apple will bump the RAM to 1GB for the latest iPad iteration. It is currently believed that the iPad 3 will introduce upgrades to the line’s cameras. One report suggests that the front-facing camera will be upgraded to a “FaceTime HD” camera. However, more evidence suggests that the rear-facing camera will see the biggest improvement. Some peg the new sensor at 8MP. It is known that the hole for the lens on iPad 3’s rear shell is noticeably larger than the iPad 2’s hole. This suggests a bigger sensor, and thus, higher resolution photos. As mentioned in the previous report, it is still uncertain as to whether the next-generation iPad will come with 4G LTE technology baked in. Some reports suggest that it will. However, as noted previously, only certain areas in the US have access to 4G LTE coverage, as the major US carriers are scrambling to deploy the next-generation technology. Personally, I’m still uncertain regarding the inclusion of LTE technology in the new iPad. On the one hand, the iPad has a big enough battery to power the radio. On the other hand, let’s say the new iPad has enough battery, and space for the 4G radio. Would the inclusion of this technology set up the expectation that the next-generation iPhone will also have 4G built in? I think so, and I do not believe the technology will be small enough and energy efficient enough for Apple to include it in the next-generation iPhone. So would Apple just continue ahead and build the best iPad possible, and allow the iPhone to twist in the wind without 4G for another year? Or, would Apple deliberately withhold 4G from the iPad for another year until the technology catches up, and both devices can comfortably support 4G? Or would any of this matter to consumers? I don’t know. Whether the iPad is built with 4G or not would be a decision based on consumer expectations as much as technical issues. Nothing inaccurate or grammatical here – just an editor type thought – when has Apple ever worried much about consumer expectations? When I wrote my first piece about the new iPad, speculation regarding what the device will look like at launch was more diverse than it is now. A month later, some facts and supposed component photos have been trickling in. First off, the back casing of the iPad 3 looks very similar to the iPad 2’s casing. Upon closer inspection however, one can see that the iPad 3’s tapered edge is even more gradual than the iPad 2’s. Also, to my complete amazement, the iPad 3 is ever-so-slightly thicker. Almost unperceptively thicker. This (very slight ) concession was made to make room for the components needed to power the new display, I would wager. So, in regards to my last piece, I was half right and half wrong. Apple did indeed make the iPad 3 thicker, which was a design concession I was amazed they would make, even after laying the design groundwork with the iPad 2. But in making the middle of the device thicker, it looks as if the tapered edges are thinner. So really, I wasn’t right at all, but the thickness has increased so marginally that few would even notice the difference. Even though there is little evidence to support this guess, I still believe Apple will move the iPad 2 (possibly with just 8GB of storage) down to an entry-level position at, let’s say, $399. Apple could offer this pricing scheme in an effort to be more competitive with Amazon’s Kindle Fire, which is priced at a modest $199. On the other hand, some reports are now claiming that the iPad 3 will have a $80 premium over the iPad 2, and the iPad 2 will remain at $499. I doubt this, but it’s not outside the realm of possibility. It seems all but certain that the new iPad will still support Apple’s Smart Covers. In fact, one report even claimed to have the internal magnets used to attach the covers, in their possession. Besides, the iPad 3’s case looks like it is going to be similar enough to the iPad 2’s to support Smart Covers. It remains to be seen if existing Smart Covers will work with the new iPad, or if Apple will nickel-and-dime their customers into buying new ones. That said, I suspect the iPad 3 will not be targeting customers who purchased the iPad 2, but instead people who purchased the original iPad, or have yet to purchase their first, so I will be surprised (but not shocked) if iPad 2 Smart Covers do not work with the new iPad. A recent report cropped up claiming that Apple was working on an 8-inch (or 7.85″) version of the iPad. This follows along the lines of several other rumors which claim Apple will be rolling out a smaller iPad in the near future. I, along with other reporters who are far more intelligent and well connected than me, do not believe Apple will be bringing such a device to market. At least not for a while. Apple testing a design is very different from Apple bringing a design to market. Something that I totally forgot about in my last report was Siri. If I had to guess, and this is just a half-baked guess on my part, Apple will bring the same Siri we’ve all come to know and love on the iPhone 4S, to the iPad 3 this March. I cannot see an instance on the iPad that Siri would not be as useful as it is on the iPhone 4S. I suspect Siri would be bundled in iOS 5.1 which is rumored to be released with the next-generation iPad. 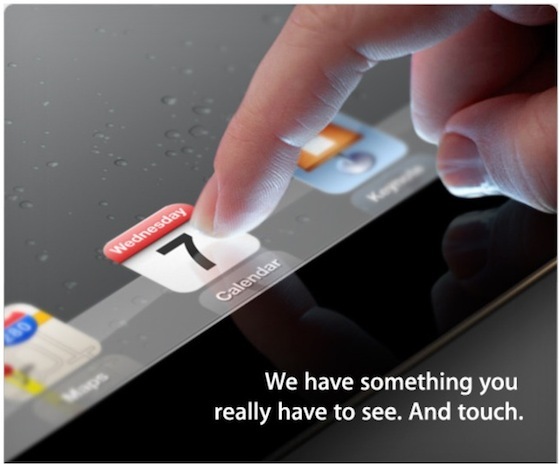 Additionally, I believe Apple will only bring Siri to new hardware, and not to the iPad 2. Let’s be pragmatic – built-in obsolescence helps to sell more devices. So, as we approach the rumored March 7th launch date, here is what I believe the evidence gathered so far points to: It seems all but confirmed that the new iPad will have a doubled up resolution 2048×1536 “Retina” display. To power this new display, Apple will build in a new quad-core processor (named either A6 or A5X**) with greater graphics capabilities. The device will also likely have improved camera quality, and possibly 4G LTE networking. It seems the overall design of the device will change every-so-slightly. The edges will be more tapered than the current iPad 2 design, while the thickness of the device will increase, although almost immeasurably. I would not be surprised if current-generation Smart Covers work with the new iPad, nor would I be surprised if Apple brought Siri to the device. If the rumored launch date is correct, we have less than one week before we see what Apple has in store for the new iPad. *MacRumors is a publication that does not report something as fact unless they are certain. ** A very recent report even suggests that this may not be the same processor, and Apple may be simultaneously developing for two distinct chips. My guess would be that the “A5X” would go in a new, low-end iPad 2, while the A6 would power the iPad 3. This however, is noting but pure speculation on my part.